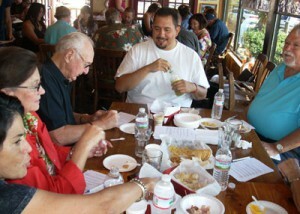 A record number of judges showed up for our fifteenth annual Scovie Awards judging on October 4, 2010 at the County Line Restaurant in Albuquerque. More than 100 food industry professionals—plus foodie media people—crowded into two sessions with six tables each and tasted about 650 products. This means that the average product entered got tasted and judged by six or more judges, an all-time record for us. The real surprise of the judging were the eventual scores for Grand Prize Winner—the highest recorded score out of a perfect 50. For the first time in Scovie history, we had a tie to three decimal places and were unable to break it, so congratulations to our co-Grand Prize Winners, Barhyte Foods’ Saucy Mama Creamy Horseradish and Poco Dolce’s Super Chile Toffee Squares. The Advertising and Marketing Grand Prize Winner was Crazy Uncle Jesters’ Company or Product Logo/Label. A Grand Prize Winner that’s a sweet heat product is not unusual at all, as fully half of our Grand Prize Winners have been in that category. But horseradish finishing so strongly, that’s simply remarkable. Journalist and author Larry Greenly claims he has been a judge at every single Scovie Judging—and I have no reason to doubt this. Thanks, Larry, you’re a loyal chilehead! Here are some of the many past Scovie Award Winning Sauce Makers and a few of their featured sauces. Click here to enter the Scovie Winners Category or you may click on any of the Sauce Makers logos below to view their featured sauces here at The Hot Sauce Source.